Jeremy, how dare you bring Bill Maher into this? I read the story you linked to, the one in which Maher makes the counterintuitive argument that “socialism” makes the NFL great. All because of a hard salary cap and revenue sharing? Pish posh. Nobody can deny that the NFL better serves small-market teams than, say, soccer leagues in Europe such as Spain’s La Liga or England’s Premier League, which are dominated by a handful of mega-rich teams. That’s why American greedheads have been airlifting dollars across the Atlantic as fast as they can overleverage themselves. I can’t think of an American sports league that’s more capitalist than the NFL. More corporate, more profit-driven, more relentlessly red-meat. Roger Goodell just understands better than some that what’s good for the goose is good for the gander, provided we’re restricting goodness as much as possible to 1 percenters. Is parity a natural byproduct of the league’s desire to protect its monopoly? It could be. But you also have to wonder if the reason the NFC has sent ten different teams to the last ten Super Bowls owes as much to the short length of the season and the violent nature of the game, in which a few injuries can alter a team’s fortunes overnight. It’s hard to assess equilibrium under those conditions. Even Green Bay, which is on a 13-0 run, including the Super Bowl, barely made the playoffs last year. The AFC may not have fielded such a diversity of champions over the last decade, but, as we can see in the case of the abysmal Peyton Manning-less Colts, parity can strike at any moment and without any directive from the commissioner’s office. It’s true that an injury to Tom Brady or Ben Roethlisberger would be disastrous to their respective teams. But the Patriots defense allowed 427 total yards and 29 first downs yesterday. I don’t know how you win anything doing that. Heading into this weekend, the Jets, Buffalo, Baltimore, and Houston were all rated ahead of Pittsburgh in terms of how well they’re playing and should continue to play, according to our wonky friends at Football Outsiders. As we approach the midpoint of the season, parity—whether a product of monopolistic capitalism, injury, or dumb luck in a small sample size—prevails. Which I guess is why I’m less convinced that the Patriots and the Steelers are such clear front-runners for the AFC title. And now to Tim Tebow. We have discussed Tebow ad nauseam here, but it’s worth spending a few more words on the nausea, especially after Tebow’s vomitous performance against Detroit on Sunday, one that saw him satirized on the field by the Lions’ Stephen Tulloch. 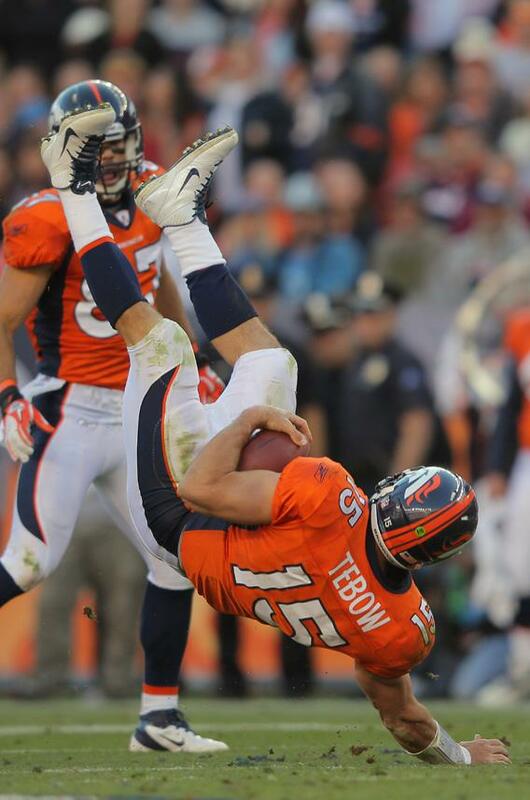 In his last two games, Tebow has been sacked 13 times. That’s not a fluke or the fault, entirely, of a bad offensive line. That’s a quarterback drowning in the deep end of the pool. Tebow fumbled three times, was 4-for-13 for 37 yards at halftime, and earned a 3.4 on ESPN’s Total QBR rating, the lowest since 2008 for any quarterback with enough snaps to qualify. Tim Tebow is a great person and a great example of a human being. But as a quarterback in the NFL, he is the worst in the league. Tebow inspires many people. He enrages many others. Yes, yes. He’s handsome and white and wholesome. Yes, yes, yes. But there is something more to this story than that, and I’ll be aw shucks and doggoned if the NFL isn’t fully aware of it and exploiting it, to say nothing of the media. Even a minor ESPN article last night spawned a new Tebow meme in the comments section. A lot of this schadenfreude feels manufactured. But, hey, schadenfreude sells.